Yikes that rain is cold this morning! It looks like there’s a chance of frost this evening as well, although the forecasts are for about 34 degrees. Looking at the long range forecast, it seems like there’s a chance for below-freezing temperatures around Halloween. BUT, since we are down to cool season vegetables in the Demo Garden, it doesn’t make much difference to us what the weather forecast is at this point! Okay, I forgot about the sweet potatoes. 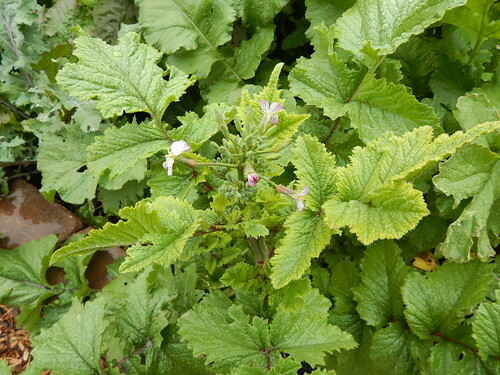 Those are coming out this next Tuesday though, so after that we are left with our perennial herbs and cool season vegetables. I braved the cold rain to get a few more pictures this morning as well. Do you see it? 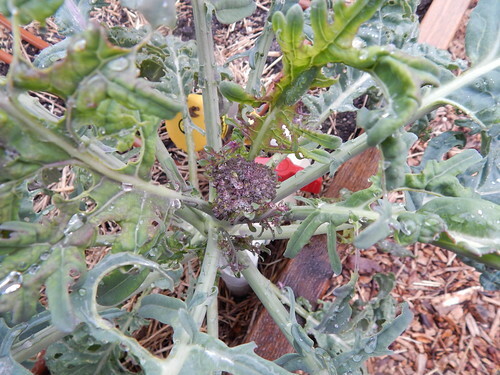 This is the ‘Purple Peacock’ sprouting broccoli in the Kids’ Snack Garden. There’s the beginning of one tiny head of purple broccoli. From looking online, it seems like it should get bigger than this before we harvest it. One of the ‘Rattail’ radishes has bolted and started to flower. Yay! We should have a rattail or two to try later on. These salad greens have long since overgrown the “salad” stage, but they do still look beautiful and tasty! 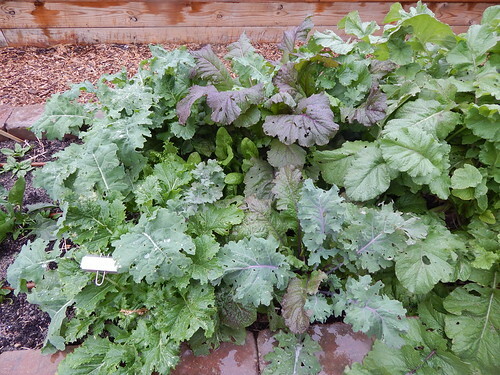 Mostly they are kales and mustard greens, shading the endives/escarole/chicories in between them. 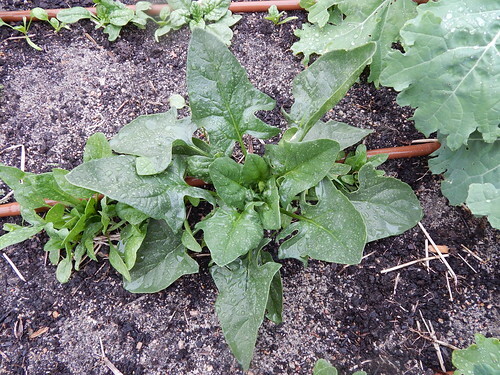 In the spinach section, there is one big plant sporting pointy leaves (not usually a good sign), and a bunch of small plants. This heirloom ‘Purple of Sicily’ cauliflower is still just thinking about starting a head, but the veins, leaf petioles (stems), and main stem are such a pretty light lavender color that I wanted to share anyway. 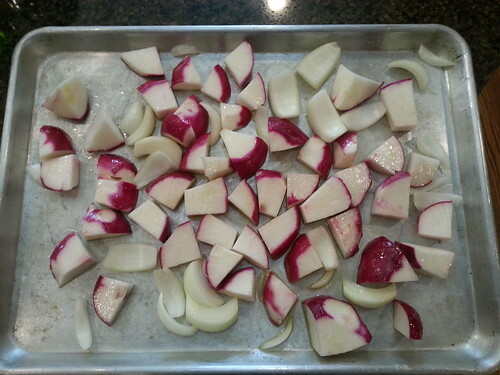 One of our Master Gardeners took a few of the ‘Scarlet Queen’ turnips to try a recipe for Pink Turnip Soup. The turnips had a nice red skin and a little pink in the centers. Unfortunately, she said the the color wasn’t strong enough to make the soup pink and it turned out to be an ugly brown. Oh well…at least the before picture is nice! I had every intention of posting more than once this week, but apparently it wasn’t to be. I’ll have at least one additional post next week, (I hope! ), although things are slowing down a lot in the garden. Oh yeah, major change in the landscape this week! Our vegetable arbor is gone, so we can see the rest of the garden a bit better. All the tomatoes, peppers, eggplant, vine crops, and basil are gone. 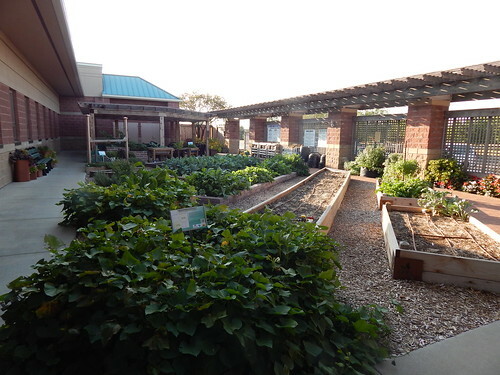 All we have left are the flowers, the brassicas, root vegetables, leafy greens, and sweet potatoes. And a bunch of herbs. After a particularly crazy September, our tomato harvests were slowing way down. 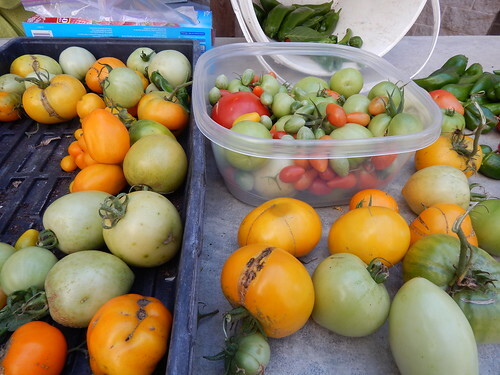 We picked all the ripe tomatoes and the good sized green tomatoes when we took the plants out. This isn’t quite all of them, but we wouldn’t have gotten many more tomatoes this fall even if we had left the vines in place. 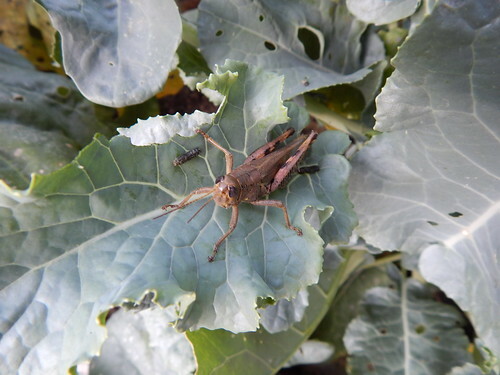 I’ve seen several good sized grasshoppers around the garden today. This one is hanging out on a cauliflower plant. I saw a particularly big green one in the parsnips, but didn’t have my camera at the moment. We aren’t going to do anything about them. At this stage, not much is going to kill them other than a heavy boot. When we pull out our tomatoes and peppers, I always like to take a look at the roots. 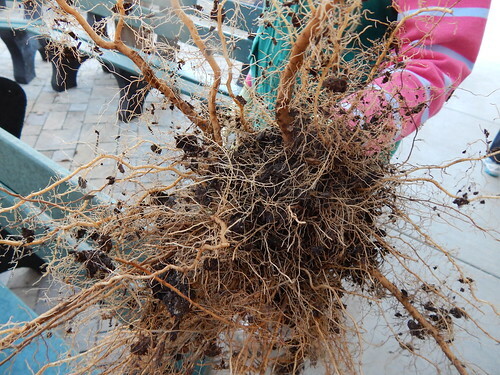 All our plants had nice healthy roots this year, with no signs of nematodes. The roots are nice and smooth, have good color, lots of root hairs, and no knobby distorted growths. Hurray! Before we redid the garden, we almost always had some bad nematode problems on the tomatoes. While almost all the broccoli is well on its way to forming heads, the cauliflower is still just thinking about it. 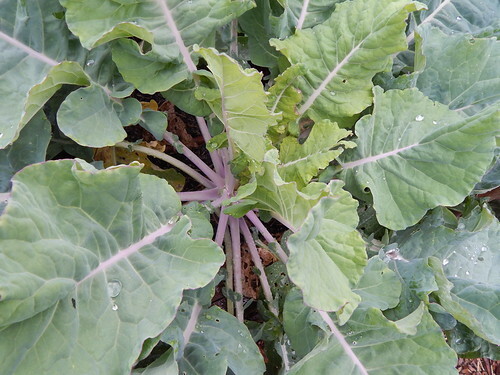 But, the fact that they haven’t bolted (sent up flower/seed stalks) is a good sign and the weather forecast for the next couple weeks looks ideal for producing great quality cauliflower. I’m excited to share pictures of all the different colors! Even with a couple of hotter days this week, I have to confess that I’ve really been enjoying the weather. The cool mornings are the best! Unfortunately, it means that our melons and eggplant have really slowed down. The tomatoes are still going pretty strong. I think I may show the view of the garden from this angle for a few weeks, at least until we take those cherry tomatoes down off the trellis. 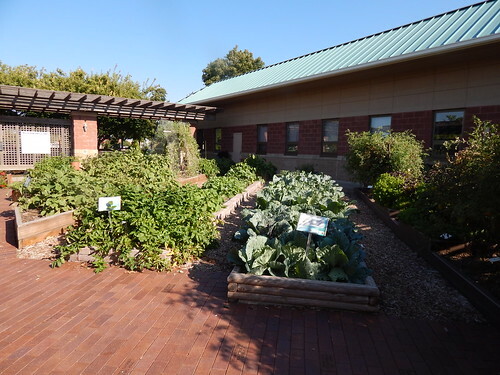 The vegetable arbor is kind of blocking the view of the rest of the garden. 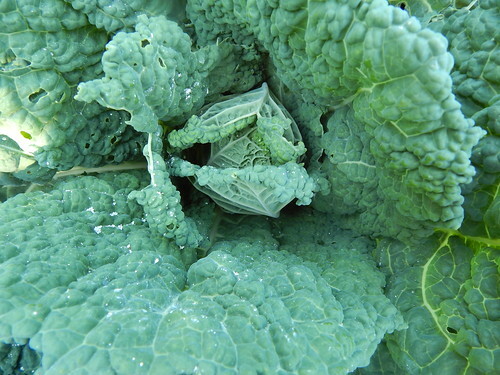 This way you can see the awesome blue-green color of all the Brassicas. I’m also thinking about doing a “Year in Review” PhotoEssay later this fall. 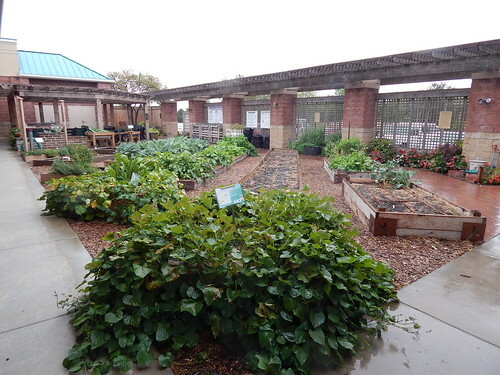 It will be kind of a “time lapse” look at the garden through the whole summer. Look for that in early November, perhaps? Look at this! 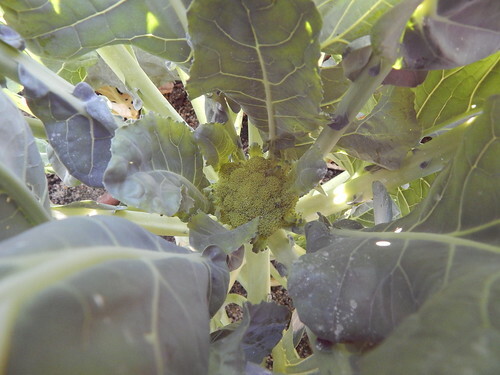 I’ve been watching the broccoli and cauliflower closely, expecting that they may start forming heads soon, and this broccoli plant is just now getting started. I kind of thought the two sprouting broccoli varieties might have been earlier, but I guess not. This cauliflower plant looks like it might be thinking about starting a head in the center. Lots of the newer varieties are self-blanching (meaning the wrapper leaves curl over the heads to help keep them nice and white), and I wonder if that’s what’s going on with these little new leaves in the center. 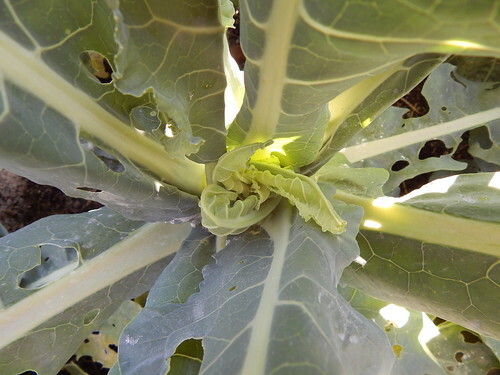 This savoy, ‘Famosa’ cabbage is starting to form the head in the center. 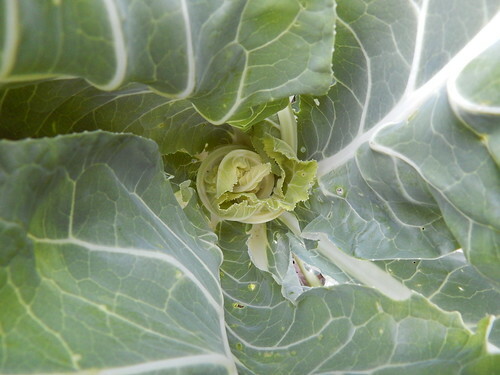 All the cabbage seem to be starting to form heads, although with all the caterpillar damage, I’m not sure how edible they will be! This one seems to have the least damage, maybe because of the ruffly leaves? I was out at the John C. Pair Horticulture Research Center down in Haysville last night. 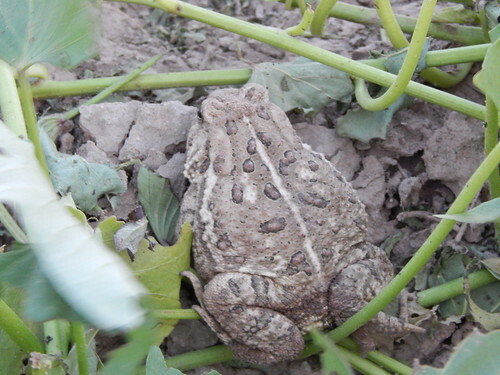 When we were out in the sweet potato fields, there were tons of toads hopping all over! I managed to get a picture of this one. It’s pretty amazing how well he blends in with the color of the soil! 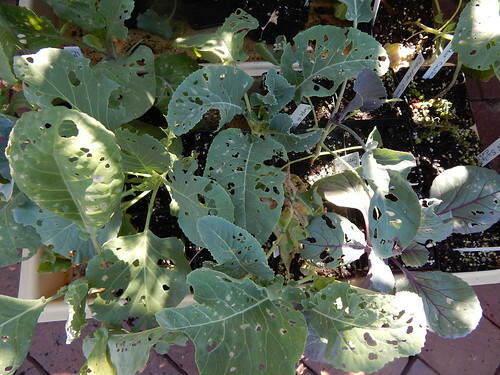 Yesterday morning we inspected all our Brassicas to see if we still had more caterpillars to deal with. Um, yes. Yes we did. I know you see the bigger cabbageworm, but do you see the tiny one too? It’s along the purple midrib. These guys start really small but eat and grow quickly. Yuck. We also found some eggs that haven’t yet hatched. We dusted with Dipel Dust to see if we could get better control. Of course, with the shaker cans, it is a real challenge to get even coverage and not put on too much. 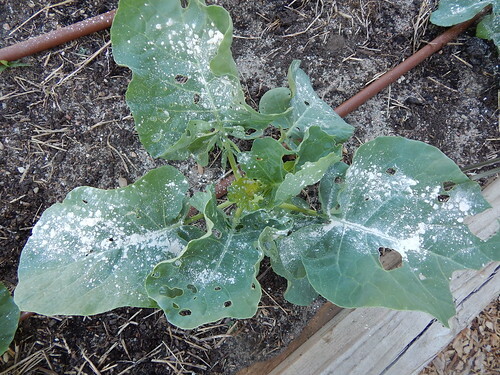 If we aren’t seeing better control by later in the week, we may have to bring out the big guns…I saw that one single cabbage butterfly can lay up to 300 eggs in its lifetime. I really don’t want these caterpillars to get to the adult stage! Look what got munched on over the weekend? 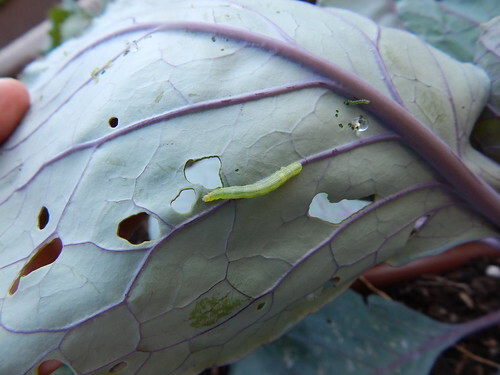 I knew we were going to be fighting a long, grueling battle against the cabbageworms this fall, but I (mistakenly) thought that they wouldn’t start hatching out and eating until today or tomorrow instead of over the weekend. To see how quickly they started, there was virtually no sign of them on Friday. This morning the plants look like Swiss Cheese. UGH! I sprayed Spinosad this morning, and we will probably dust with Dipel either tomorrow or later this week.